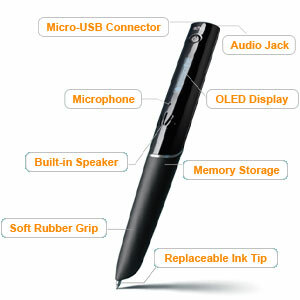 There is this new piece of technology that is out, that can be very useful especially for people who takes notes slowly during class, and that product is called the Livescribe Echo Smartpen. This is a normal ink-filled pen, but it has an extra component. That component is an audio recorder. When you are writing the notes, you can turn on this button to start recording the teacher’s voice. You can get it to your electronic device by having the pen being synced to the iPad or iPhone. This audio recorder can record up to 800 hours, and then it needs to be charged. Down below is an picture of the pen. I personally like this pen because if you have a teacher that always lectures and you can’t take all the notes down, then you can use the pen. When you have the recording you can listen to it as many times as you like. This pen has also been proven to boost college students’ grades up. Next Post → Power the Solar Cells!! !